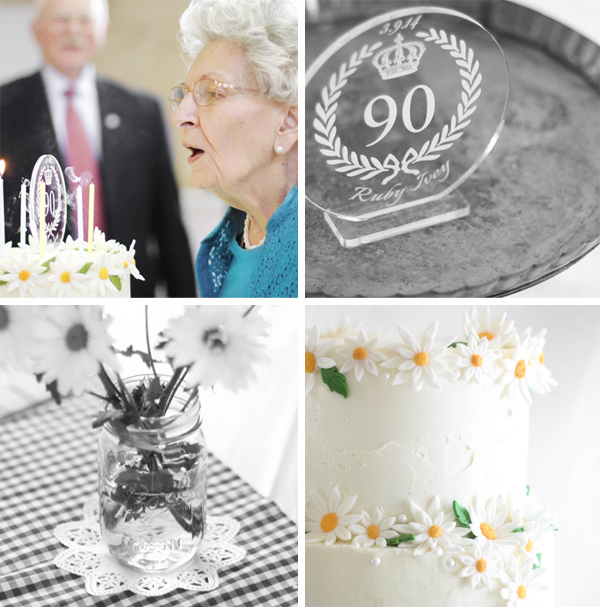 How often do you get to make a 90th birthday cake? Not often enough, I'm sure. When I found out this milestone was on the horizon for our own sweet grand-lady, I didn't wait around for anyone to ask me - I offered my cake bakery services immediately! March 9th was the special day we honored Ms. Ruby - our friend, teacher, aunt, mother, and grandmother. I could never make a cake as special as she is, but it was my great honor to try. My sissy-lou, Megan, themed the party Country Chic and decorated with Mason jars filled with happy daisies and quilt-square pennants.We both put our hands and hearts together for this cake. She came over to my house one day and we made fondant daisies together, nonstop! The timing of this cake was right in sync with a new partnership I've entered into with Wilton. I've used Wilton cake decorating products for as long as I can remember, so being a brand ambassador for them is a natural fit. It's my strict rule to only promote products that I personally use (and love! ), and that will add value to the baking endeavors of my readers. The products they sent me recently were enormously helpful with the creation of this cake, so I'm going to tell you all about them. And I'm going to take you through all the steps for this chocolate cake for 100. A cake this size is a good notch to have on the ol' baking belt, and it's totally doable for thrifty DIY'ers. I mean, with just a couple of tweaks (a cute couple's cake topper?) this could be a DIY wedding cake. First thing, you'll need some special supplies. Cake pans. Choose those with straight sides, like this. Some cake pans nest for easy storage, so the top edge flairs outward slightly - you do not want this type of pan. It makes the sides of the stacked cake uneven, and that makes a real mess of things when you start frosting. I used two of each size aluminum pans: 10x2-inch and 8x2-inch. Choose a cake stand. The bottom tier of this cake is 10-inches round and over 12-inches tall, so choose something about 12-inches in diameter and sturdy. The finished cake is very heavy. A stand that's low to the table surface like this is ideal. Inner support for the cake. You'll need a 10-inch cake drum, and one 8-inch and one 10-inch plastic cake separator plate - you can find those here. 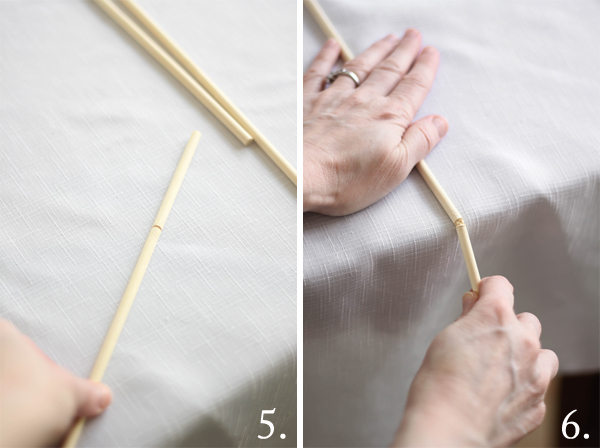 Pick up two sets of wooden dowels, too - and don't worry - you won't need any special equipment to cut them to size. I'll show you how later in this post. Prep the pans. I used Bake Easy flour-based spray. This is by far the easiest way to grease and flour a pan in one easy step. Just spray it on the sides and bottom before you pour in the batter. It also decreases the amount of crumbs you have on the cake when it's turned out of the pan (win/win!). I almost never bake a cake without Bake Even strips. You soak them in water and place them around the sides of the cake, and during baking, it prevents the cake from crowning (or, forming that bump on top that has to be leveled off). I already had an old set that is almost completely worn out, so I was happy that Wilton sent me a shiny new set. They've updated the design too! The old set had stick pins (which I lost immediately) to hold the strips onto the pans, but this new set has a belt-loop style cuff so you can tighten the strip against the pan - no pins needed! The cool down. Wire racks are needed so the cakes can cool completely without becoming soggy on the bottom. I suggest using at least one grid-style cooling rack, but three will make your life easier when making this recipe. Now, you don't absolutely have to have a revolving cake stand, but it helps tremendously with frosting a cake evenly. If you're not excited about dropping 50 bucks on a professional style model, you can use an ordinary cake stand placed on a lazy susan. My OXO turntable was about $11, and I still use it when I don't want to pull out Old Ironsides. You can see how I use it here. The cake recipe I used is the chocolate big sister to this cake. Yes, it starts with a cake mix (which, you know I'm usually a scratch girl, but cake mixes happen in real life - please don't be a box-mix snob) and it is vastly improved upon with additions of flour, sugar, sour cream and extra cocoa powder. I use it because it is sturdy and yet retains an incredibly moist texture. In my experience, the average non-cake/cake baking obsessed person (i.e. not me) is accustomed to the moistness and texture a box mix cake offers. 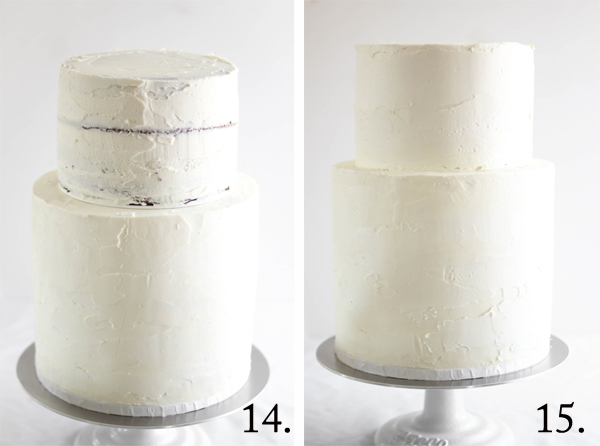 Dede Wilson calls this "The Duncan Hines Conundrum" in her book Wedding Cakes You Can Make (recommend, by the way). I agree with her sentiment infinity times one million. I find this particular recipe satisfies my desire for scratch-made taste, yet still offers most of the desirable texture the general public is accustomed to. I believe part of being considered a good baker is trying to anticipate what your audience will like, and this cake received tons of praise at Ruby's 90th celebration. Before we get to the cake recipe, I'll share a few snaps from the party. The cake topper was really beautiful and came from this Etsy seller. 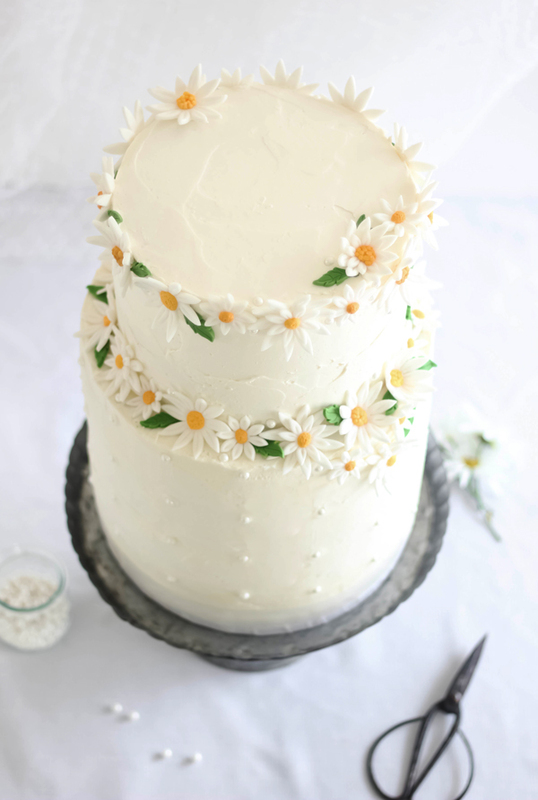 Continue past the recipe for assembly instructions and fondant daisy tutorial. It's a good idea to read the recipe through once from beginning to end before starting. Please note that the cake ingredients will be divided. You'll make two successive batches of cake batter. A standing mixer is recommended, or use a jumbo mixing bowl and a 7 speed (or higher) electric hand mixer. The directions are written assuming you have a single oven and two of each size cake pans, but if you have a double oven and more than two pans each, by all means - use them! Place 2 boxes of cake mix, 2 cups of flour, 2 cups of sugar, 3/4 cup of cocoa and 1 1/2 teaspoons of salt in a extra-large mixing bowl. Whisk together to combine. (Edit: 11/24/15 - Sifting these ingredients together will make the cake so soft -recommended!) Add 2 2/3 cups of water, 1 cup of canola oil, 1 tablespoon vanilla extract, 2 cups of sour cream and 6 large eggs. Beat on low speed until all ingredients are combined. Scrape down the bowl to make sure all of the wet and dry ingredients are incorporated. Beat for 1 minute longer. Spray two 10x2-inch round cake pans with Bake Easy flour based spray. Divide batter between cake pans, filling them about three-quarters full. You may have some leftover batter - place it in a bowl, cover with plastic wrap and refrigerate it. Soak the Bake Even cake strips (see supplies) in warm water and attach to the sides of the cake pans. Set oven timer for 30 minutes and place the cakes inside the oven. The cakes will not be done when the timer goes off, but it's good to peek through the oven window to see how things are progressing at this point. Set the timer for 10 more minutes and check progress again. Thereafter, check at 5 minute intervals (if needed) until the cake tests done with a toothpick tester. Let cakes cool in the pans for 5 minutes before turning them out on wire racks to cool completely. Remove Bake Easy strips from pans. Wash and dry one of the 10-inch pans. Place 2 boxes of cake mix, 2 cups of flour, 2 cups of sugar, 3/4 cup of cocoa and 1 1/2 teaspoons of salt in a extra-large mixing bowl. Whisk together to combine. Add 2 2/3 cups of water, 1 cup of canola oil, 1 tablespoon vanilla extract, 2 cups of sour cream and 6 large eggs. Beat on low speed until all ingredients are combined. Scrape down the bowl to make sure all of the wet and dry ingredients are incorporated. Beat for 1 minute longer. Spray one 10x2-inch round cake and two 8x2-inch round cake pans with Bake Easy flour based spray. Divide batter between cake pans filling them about three-quarters full. If you lack a little cake batter filling the pans, use the reserved cake batter in the refrigerator (if not, use the reserved batter to make yourself a few cupcakes later - you deserve it!). Soak and attach Bake Even strips to the 8-inch cake pans and place them in the oven. Cover the 10-inch cake with plastic wrap and place in the refrigerator. Bake the 8-inch cakes for 25-30 minutes, adding additional baking time until a toothpick tester comes out clean. Let them cool in the pans 5 minutes before turning them out onto a wire rack. Bake the final 10-inch layer as before, attaching soaked Bake Easy strips and checking the cake periodically after an initial 30 minute baking time. Cake is done when a toothpick tester inserted in the center comes out clean. Allow to cool completely, as with the previous cakes. When cakes are completely cool, torte each layer evenly (meaning, cut them in half horizontally). 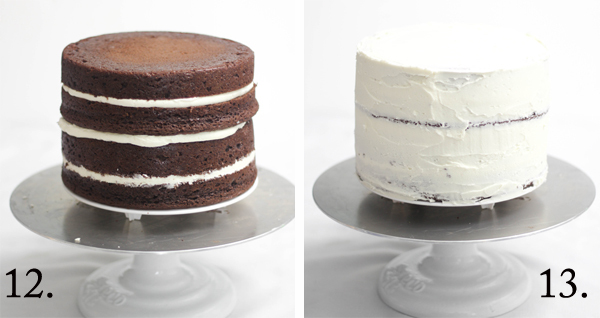 Each cake layer should now be two layers. Cover the layers generously in plastic wrap and refrigerate until ready for assembly. A few notes about these components. You'll need to have both filling and frosting made up for assembling the cakes. Also, please do not to freak out about the amount of butter in these frostings. Keep in mind that this cake serves a little over 100 guests, and that each guest will be enjoying a 2-inch piece of cake. Yes, pounds of butter go into these elements, but nobody will be eating pounds of butter at once. Also, you'll have extra frosting after covering the cake. You always need extra frosting in case accidents happen during delivery. As for the cream cheese, I occasionally buy off brand, but never EVER when I'm serving to a crowd this size. I have good working knowledge making this filling, and Philadelphia brand cream cheese has the best flavor and texture. No one's paying me to say that, I truly recommend using it. In a stand mixer fitted with the whisk attachment, beat butter and sugar on low speed until just incorporated. Switch to medium-high speed and beat until light and fluffy, about 2 minutes. Add cream cheese 1 piece at a time and beat well after each addition. Add the vanilla and salt; mix again. Cover the finished frosting with a damp tea towel so that is doesn't crust or dry out. For the frosting, mix together the butter and confectioners’ sugar in a stand mixer fitted with the whisk attachment. Begin mixing on low speed until crumbly, and then increase to high and beat for 5 minutes.Add vanilla extract and beat again for another 5 minutes until the frosting color has lightened in color and is fluffy. Scrape down the bowl and mix again on the highest setting for 3-5 minutes. If you find the buttercream is too stiff, you may add milk or heavy cream 1 tablespoon at a time until the mixture is spreading consistency. Cover the finished frosting with a damp tea towel so that is doesn't crust or dry out. Get in your most focused, zen-like state for this part of the process. It's not rocket science, but you do need full presence of mind for a successful outcome. Also, make room - and I mean a LOT of room, in your refrigerator to store this cake. I have a second cake-dedicated refrigerator and it took up the entire lower half. Again, here are the supplies you'll need. Tier 1: This first photograph is from a different cake recipe, but it illustrates how I filled this cake. The cream cheese filling is a little softer then the vanilla buttercream, so the buttercream does a good job of keeping the cream cheese filling wrangled in. 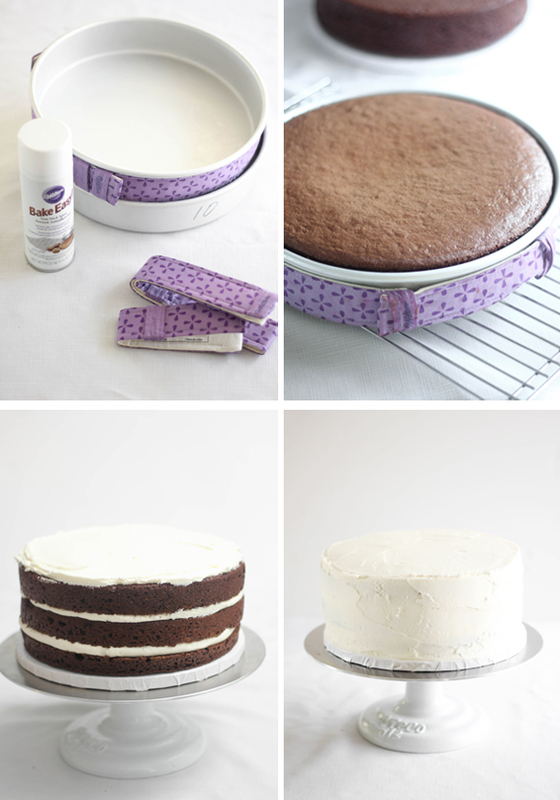 First thing, put a dot of icing on your 10-inch cake drum and add one torted cake layer. 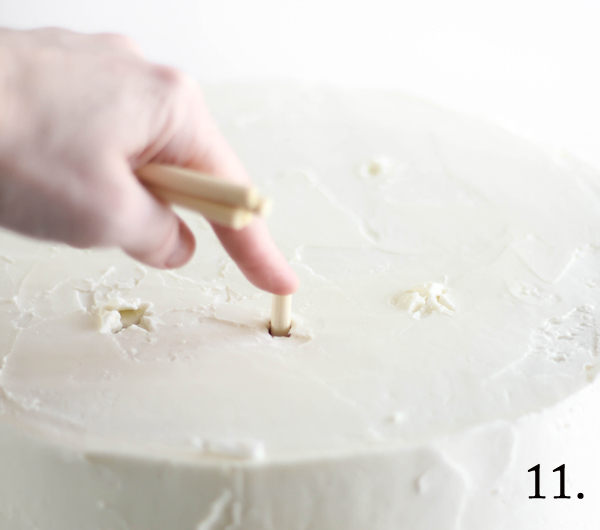 Fill a piping bag fitted with a plain 1/2-inch tip (or no tip at all) with some of the vanilla buttercream. Pipe a line of butter cream around the top edge of the cake (like in picture #1), making an enclosed circle. Place 1 1/2 cups of the cream cheese filling inside the circle and spread evenly. Top with another torted layer. Pipe a line of vanilla cream on top of the second layer and fill with 1 1/2 cups cream cheese filling as before. Place a third torted layer on top of the second layer - take care to line the cake edges up as evenly as possible (no matter how hard you try, it won't be perfect - just do the best you can). Cover the top of the cake with vanilla buttercream. Cover the entire cake with a slightly thicker-than-usual crumb coat. We're making this layer thick because this is chocolate cake, and we don't want ANY brown crust showing through. Place this first tier in the refrigerator to set, about 1 1/2 hours. Tier 2: Place a dot of icing on the the 10-inch plastic cake separator (this is what it looks like, in case you've forgotten), stack and fill and frost the remaining 10-inch cakes as before. Place in the refrigerator to set. After the cakes chill and the frosting is dry to the touch, measure a wooden dowel against the bottom cake tier (the tier on the cake drum). 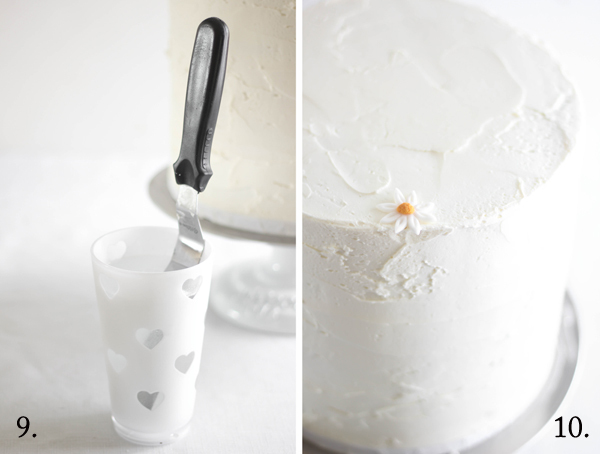 Score the dowel with a pair of scissors just below the top of the cake tier. Break the dowel at the scored mark. Repeat the process with the remaining dowels. Press 5-6 dowels into the cake vertically, and in a circle within 2-inches of the outside of the cake. Place one in the center of the cake also.The dowels should not stick up from the top of the cake, and if they do then you'll need to trim them shorter. Reserve the remaining cut dowels for later use. Stack the second cake tier on top of the doweled first tier. Press tier 2 down into the first tier until the legs on the plastic separator are embedded into the cake. Try to line up the edges as much as possible. Cover the entire cake with a thick layer of vanilla buttercream. I usually spend a ton of time on this part, trying to get the outside perfect, but I don't mind a few frosting swirls showing. It makes the cake look more delicious, if you ask me. One way to achieve smoother icing is to warm your spatuala in hot water, wipe it dry, and then smooth on the frosting. You'll immediately see a difference in how the frosting glides across the surface. The heat melts the butter in the buttercream as it smooths on. Examine the cake and determine the front. This is purely for decorating purposes for this cake, as some of the fondant daises slightly cascade to the front right. That said, all cakes have one side that looks slightly better than the other. Place the best side to the front. If your cake is going to be displayed in the center of a room where people can examine it up close on all sides, then budget for lots of extra frosting/perfecting time. Whenever I have the front of my cake chosen, I mark it in some small way. You can see that I've used a small daisy in picture #10 to remind myself where the front is. When the cake is frosted to perfection (or near perfection) place it in the refrigerator to set. 1 to 2 hours time should do it. After the cake is chilled, remove it from the refrigerator. Grab the 8-inch plastic separator plate and center it on tier 2. Press it down so the legs insert into the cake, and then remove it. Dowel the cake with the reserved cut dowels between the leg marks. Place one dowel in the center of the cake also. Place the cake back in the refrigerator while you work on the top tier. 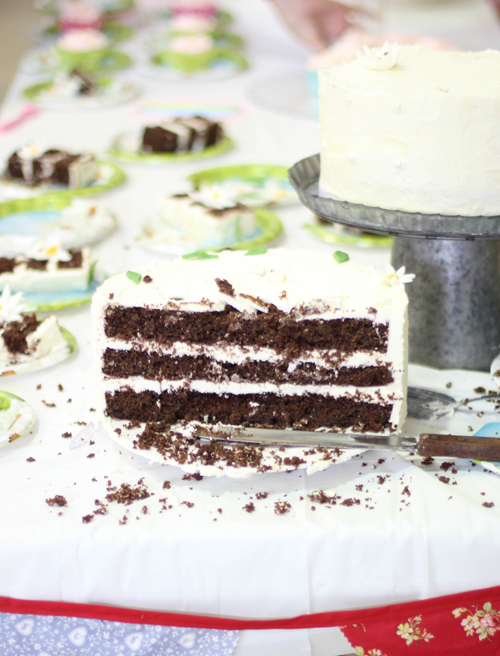 Tier 3: Place a dot of icing on the 8-inch plastic separator cake plate. Center a torted 8-inch cake layer on the cake plate, pressing down slightly so the icing dot with adhere to it. Pipe a line of vanilla buttercream in a circle on the first layer (as before with the 10-inch tiers) and fill with 3/4 cup cream cheese filling. Repeat process with remaining layers. Again, frost the entire tier with a thicker-than-usual crumb coat and refrigerate for 1 1/2 hours. When the top layer (tier 3) is set (icing is firm and dry to the touch), line up the 8-inch tier's plastic separator legs to the leg indentations made previously on top of the cake. Press the top tier down into the cake. Frost the top tier with vanilla buttercream. Take this time to further perfect the icing on the cake, and fill in any gaps that separate the bottom large tiers from the smaller top tier. Place the finished frosted cake in the refrigerator until time to decorate. The daisies were a lot of fun to make, and if you've ever played with Play-Doh, then I'm confident that you can make these decorations, too. 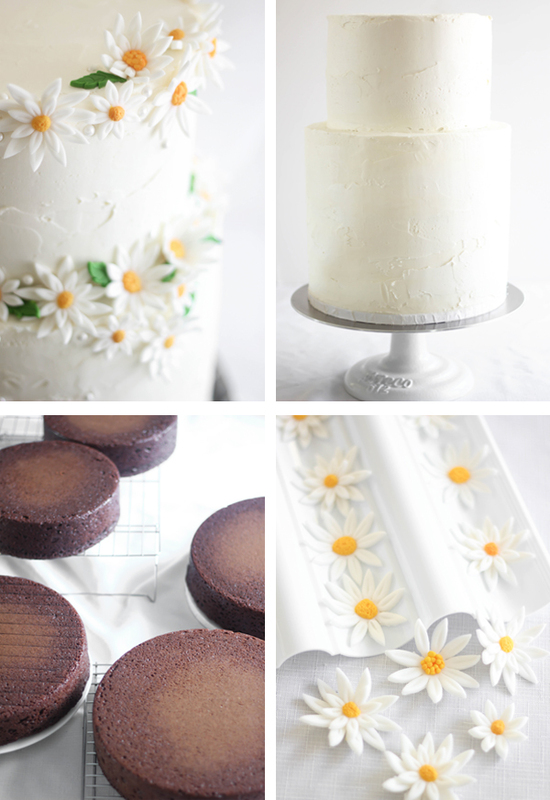 Wilton sent me some fondant cutters and a neat flower impression mat - the latter I just loved for making the daisy centers. First knead a little of the white fondant until it is pliable. Lightly grease a work surface with the white vegetable shortening and roll out the fondant with a rolling pin. 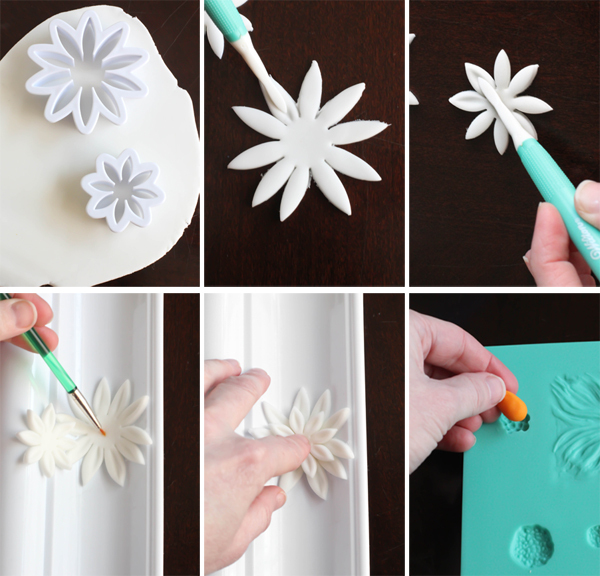 Cut out several daisy shapes with the Daisy Cut-Outs fondant cutters. 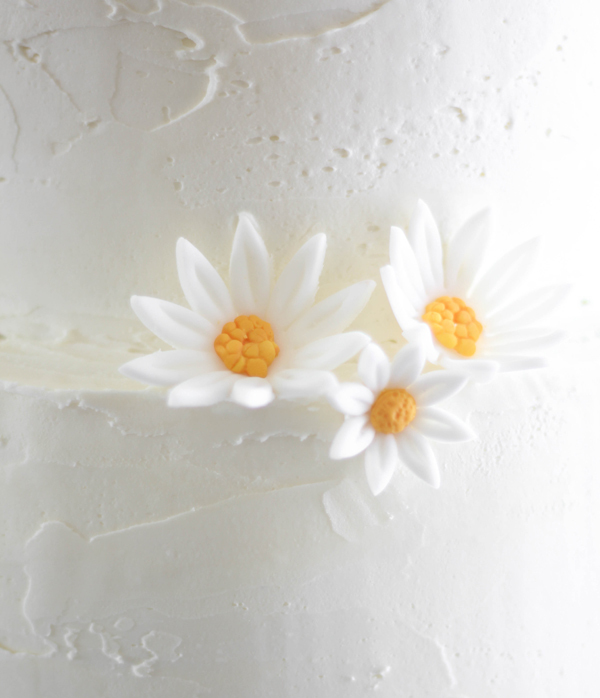 Use the fondant tool with the #5 tip to give dimension to the daisy petals. To make a double daisy, place a dot of corn syrup on a large daisy and top with a smaller daisy in the center. To make the daisy centers, roll a small amount of the orange/yellow fondant into an oval and press it into one of the flower center cavities in the flower impression mat. While holding the fondant in the cavity, slide a small knife underneath the excess fondant and cut it so that the center fondant is flush with the top of the cavity. Remove the flower center with the tip of your knife (or a toothpick) and adhere it to the center of the daisy with a little dot of corn syrup. Place the finished flower in a flower forming tray, flower forming cups or in the cavities of a clean, empty foam egg carton. This will give the flowers dimension, so they'll look more authentic. 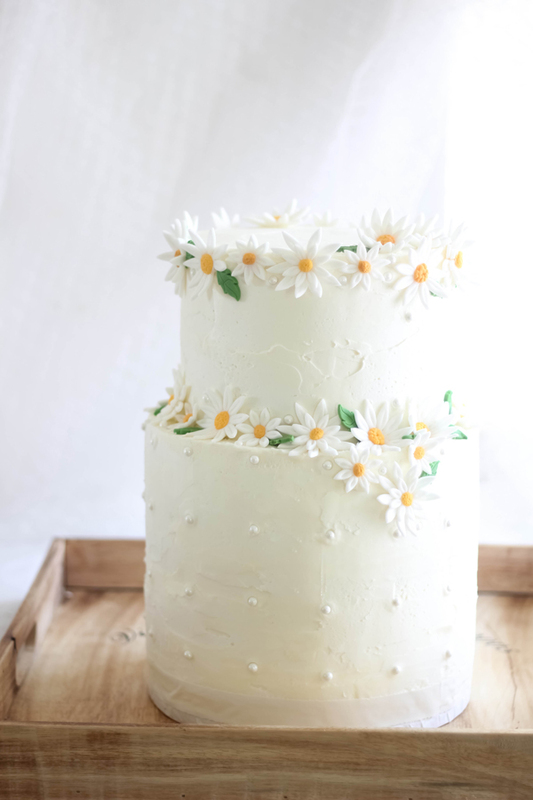 Make as many daisies as you care to for this cake, but let them dry for a few hours before you start placing them on the cake. They'll adhere well with a dot of buttercream, and you should have plenty leftover for this purpose. I also made some leaves with this fancy leaf press and green fondant. 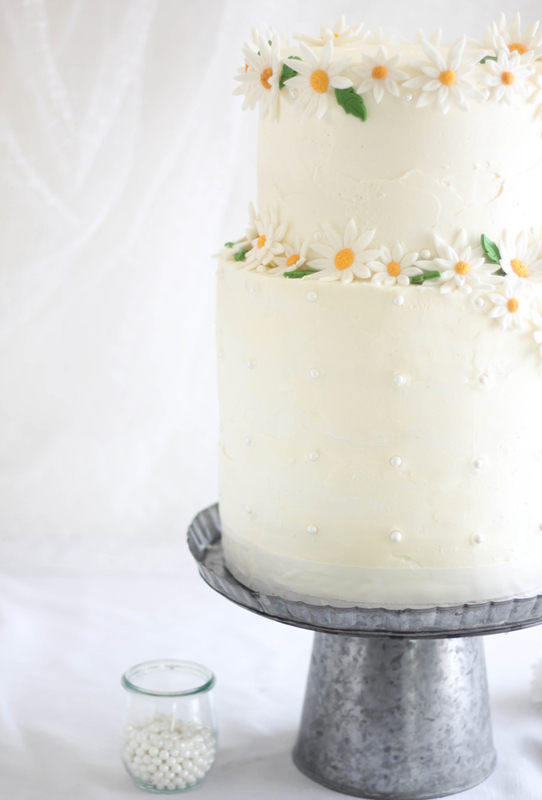 I used the leaves sparingly on the cake because I didn't want anything to take away from the sweet little daisies. If you need to refrigerate the cake after you decorate it with the fondant flowers, then don't cover it in plastic wrap - don't do it! The fondant will get soft and become greasy-looking and look generally unappetizing. Just leave everything uncovered in the refrigerator, then allow the cake to come to room temperature over the course of a few hours. Transporting the cake: Holy smokes. This was the most nerve-wracking/wrecking part of the whole project. This cake had to make an hour + journey through the hills and valleys of East Tennessee, and yes, it did get bumped and dinged a little along the way. I suggest carrying a frosting emergency kit, even if you don't have very far to travel with it. I transported the cake on a very large, sturdy wooden tray in the back seat of our Jeep Liberty. I really needed some grippy shelf lining to line the tray so the cake didn't slide around, but I didn't have the foresight of needing it. And yes, the cake did slide around a little inside the tray and it did get a ding or two (even though I was sitting in the back seat holding it), but otherwise it rode fairy well. I used some sugar pearls to decorate the lower tiers, but I'm not sure I'd repeat that step again. I ended up getting a piece of cake with a pearl on it, and it seemed totally foreign to the texture of the cake - almost unpleasantly so. But they are pretty -decide for yourself. Cutting the cake: Again, holy smokes! This was trial by fire for me. I'm accustomed to leaving the cake cutting to the caterers, but we didn't have a caterer at this party. So this was my first time cutting and serving a cake of this magnitude and I really wasn't prepared. I knew how to portion the cake, but not how to do it without making an enormous mess. And I'm pretty sure I served someone a wooden dowel in their slice (cringe), live and learn, right? All the guests were really nice and no one pointed out their dowel. My guide for cutting this cake. What I did to the cake! If you end up being the cake-cutter, you'll have to disassemble the cake before slicing it. 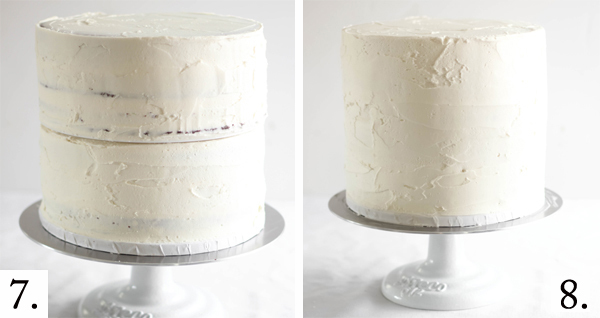 The first tier will lift of rather cleanly with an off-set spatula wedged underneath- the buttercream won't stick to the plastic cake plate as long as you refrigerated the tiers until dry and set as indicated earlier. The next tier is a little trickier- you'll have to use a finger to locate the plastic cake plate through the icing in the large tier. But it lifted off just as easily as the first tier did. As for slicing, the magic trick (that I obviously didn't know) is to warm your knife between slices in a glass of hot water, and dry it quickly with a tea towel before cutting the cake into pieces. Otherwise you're just putting the crumbs from the previous slice of cake right on top of the next slice. I also really like this post by a nice lady named Debi, she does not use a warmed knife, but her descriptive words pictures are very helpful should you find yourself in my predicament. Well, I have certainly used a lot of words in this post, but there's only one more important thing I have to say - Happy Birthday Dearest Ruby! I'm already planning a cake for your 91st! Heather, I really enjoyed reading this post. Your kind heart and love of Ruby really comes through in your writing of this post. Obviously, your amazing cake making skills are shining as well! I love daisies and the party theme seems like it was just perfect for the occasion. I tried to make a layered cake last year for my mom's birthday. I used 3 round layers. I did use boxed cake mix and it completely collapsed under the frosting! Needless to say, it all went into the trash and I made cupcakes the next morning before we headed to her birthday party! I do not foresee another layered cake in my baking future at this time, but if I do I will refer to your expertise! Peace to you from Oklahoma! Love the idea of those bake even strips--I'm going to have to get some! And I have their rotating cake stand, which is amazing for frosting. This cake looks awesome! Wow. This post was freaking. Amazing!! I've never done a cake of this caliber before but I feel like I can take a really good stab at it now. Everything from the Daisy tutorials to the cutting diagram to the recipe (totally forgive you for using boxed! ), it's just one big impressive bag of awesomeness! And then the reason for the cake! Ruby hitting 90, that is huge in itself! Happy birthday to her! Amazing post, beautiful cake. Can't wait to keep on following what you do here. Gosh I remember doing my first double barrel cake a few months back for my nieces 100 days! What an adventure. Love your tutorial for it, so clear! 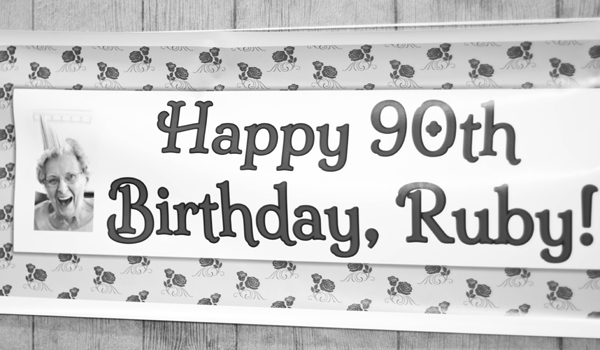 Ruby is one very lucky woman who is turn 90 years young. I too have a Grandma turning 90 this year (June), and since I'm the resident baker in the family, I insisted on being the cake maker for her party (they are leaning towards a caterer for the main food, didn't want the cake to fall in anyone else's hands other than my own). I also suggested a "Pittsburgh Cookie Table" for other relatives that want to bake. Not to sound selfish, but the cake department is MINE. Anyways. this post is very helpful since I usually only do small cakes for a few people for family birthday parties, or cupcakes. And came at a great time too while I plan her cake. Happy birthday to Ms. Ruby! : ) This cake is beautiful and I think "country chic" just about sums it up. I love that the cake is chocolate under all that lovely white frosting. Aww such a special occasion to bake a cake!! This looks perfect! Beautiful, heartfelt, labor of love! I can only hope someone would bake like that for me one day. The cake is amazing! This is the most impressive and beautifully crafted cake I've EVER seen! I really love that your tutorial was so thorough so that even a cake newbie like me could attempt it. 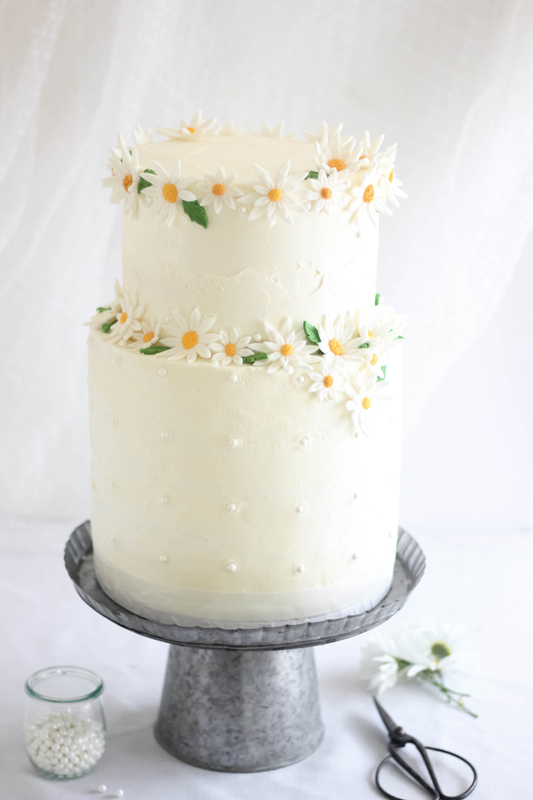 I love how the daises gave the cake an incredibly whimsical feel without taking over the entire cake. Mad props to you Heather! Ruby is a very lucky woman to have had you make such a gorgeous cake for her! Thanks for such a great post! I'm prepping to make a wedding cake for my friend in April and I'm reading everything I can get my hands on about stacking tiers and using dowels, etc etc. This is one of the most beautiful cakes I've ever seen! Love it!! Such a beautiful cake. I love the way you broke down the procedure for making the decor and assembly. The cake stand is beautiful too! Is that an Etsy find like the topper? Knock out cake, and wonderful tutorial. I learned a lot. To reduce this chocolate cake to a three layer 8-inch cake, could you give a recipe? I went through your link to your Mom's button cake but that was vanilla/almond. Mix as directed above and divide between three 8-inch pans. OH, I forgot the vanilla - add 1 teaspoon vanilla to the above. That is really pretty. I love how you made one ginormous bottom layer. Great idea for those of us who don't have that many cake sizes. As for the cake itself, I myself would never, ever use a boxed mix. (Have you ever read the ingredients list? Yuck) But I get fabulous results with Ina Garten's Chocolate Buttercream Cake recipe, which is extremely moist and a very reliable recipe. It's in the Barefoot Contessa Cookbook. There are various versions online but they are not necessarily the same as the one in the cookbook. Hi @Boudica Andred - Cake mixes always spark a lot of debate. Even as an avid scratch cake baker, I think there is a time and place for both cake mixes and scratch made cakes, but thank you for the recommendation. I'll take a look at the recipe. For other readers with box-mix fears: although I use Betty Crocker cake mixes (I freelance for General Mills), you can also use organic cake mixes such as Arrowhead Mills brand or Bob's Red Mill Gluten Free chocolate cake mix. These mixes contain natural ingredients and, well, they taste good. You may want to note that they do have a shorter shelf life. Hello! This is such a lovely cake! 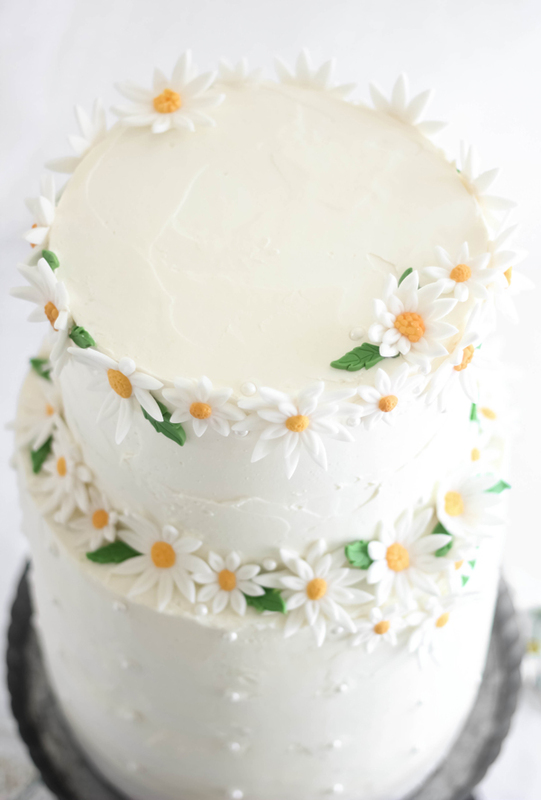 I do have a question regarding the fondant decorations: how far ahead of time can the daisies be assembled? My daughter's first birthday is next month and I'd love to decorate her party cake in a similar fashion though I feel a bit intimidated as I've never worked with fondant before. Thank you for creating such an inspiring and welcoming blog! What a beautiful cake! The daisies are fabulous! You can have them ready to go about three days ahead of time. You can store them on a parchment-lined baking sheet loosely covered with a sheet of plastic wrap and they'll stay firm but not dry and crumbly. Thank you for the kind words! Best of luck with the decors - you'll do fine! Fondant can seem intimidating but as long as you give it a good knead first, you'll do well. It'll be very much like playing with play-doh. An amazing cake for an amazing lady. Nice job!!! You are such an artist!! !I love your blog!!!! And the cake looks amazing! !So beautiful and elegant!!! Hi Heather! this post is just amazing, hopefully I'll have the honor to make such an impressive cake as yours, Could you please tell me if the recipe will work if I used a GERMAN CHOCOLATE CAKE MIX instead of a devil’s food cake mix? I just wanted to say how much I appreciate the step by step directions. I have always been too afraid to try a cake larger than 2 layers. Hi Heather! this post is just amazing, hopefully I'll have the honor to make such an impressive cake as yours one day, Could you please tell me if the recipe will work if I used a GERMAN CHOCOLATE CAKE MIX instead of a devil’s food cake mix? also it has to a Betty Crocker cake mix or can I use other brand? in your instructions you for each batch you say we should use to cups of sour cream for each batch yet the recipe calls for 2 cups total of sour cream. Do we really need 4 cups total of sour cream? Or is it 1 cup of sour cream for each batch? Hello, I have come across this recipe and have fallen in love. In August I have to make my partners sister a two tier cake the base being a 10 inch and the top a 8inch. I love using Betty Crocker so will deffo be using your recipe. however when converting the ingredients into ml and grams it appears I have to use 1280ml water and so on. Could you please confirm for me if this is correct. I only have a single oven and unfortunately only have one 10 inch and one 8 inch pan so would you be able to recommend a method I could use? The cake looks very tasty and delicious. Liked the recipe.